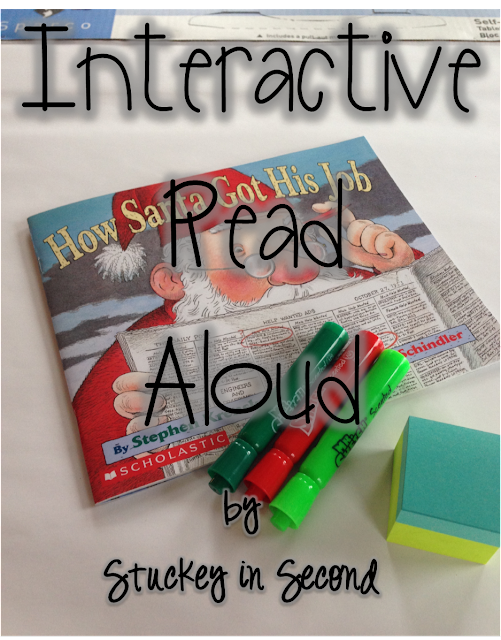 I love making read alouds interactive. 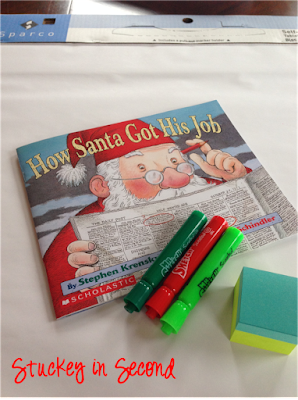 In fact, I love teaching literacy skills straight from read aloud books. It's a great way to not only get good stories into your classroom, but to teach skills that your students need at the same time. 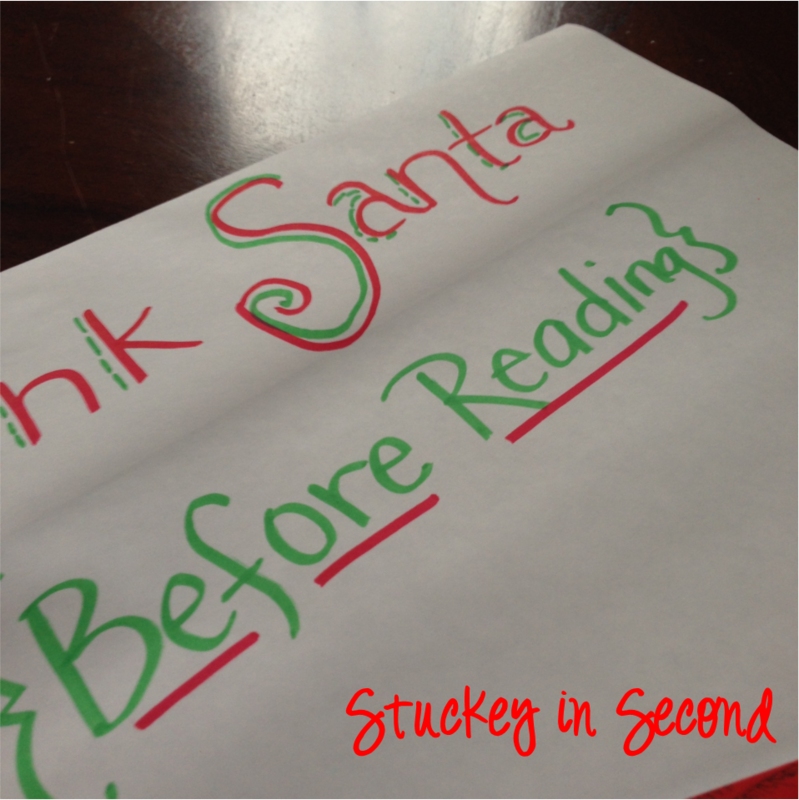 One of the most important things to do while reading a book aloud is to model THINKING WHILE READING. Your students need to HEAR what you are thinking in your head while you are reading, so they can understand what THEY are supposed to be doing when they read. They need to be interactive when reading on their own, too! In my classroom, I usually get the anchor charts "prepped" beforehand with a title, but other than that, we do our anchor charts TOGETHER as a class. That's what makes it interactive. 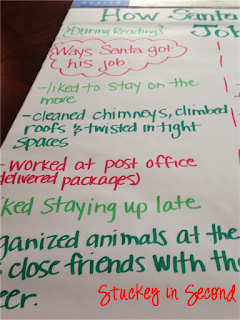 My students give me feedback on what we should add, what they want to add, etc. 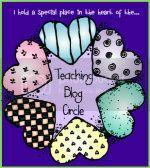 It's a SHARED anchor chart. 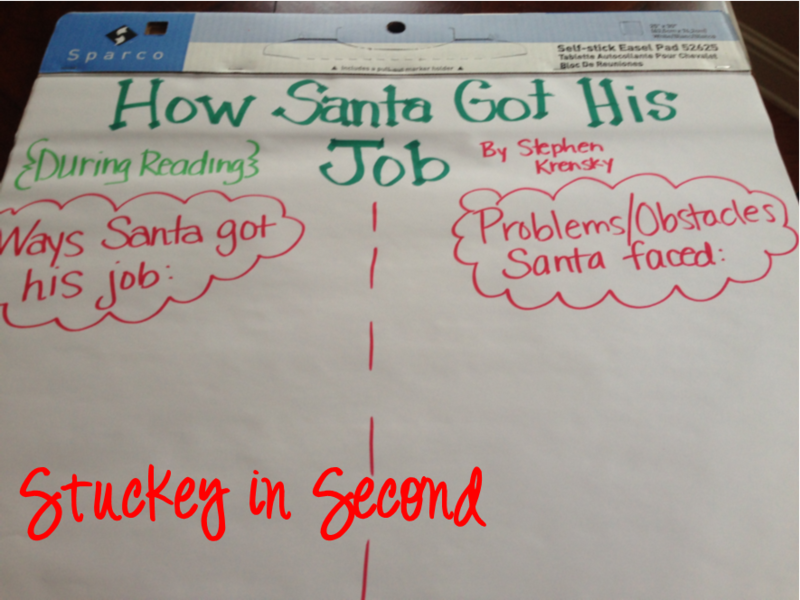 I never pre-make a full anchor chart. I find that then it's just a poster for them to stare at. If they make the chart WITH ME, they have more ownership and understanding of the concepts. 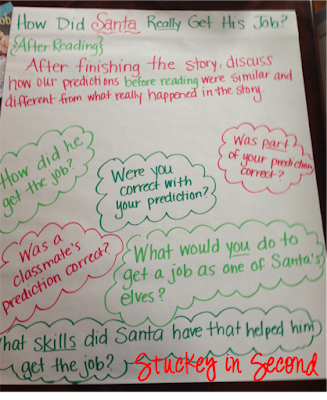 For this lesson, when students arrive in the morning, they will see this anchor chart and they are asked to grab a sticky note and record their answer/prediction on it and then stick it to the chart. This should be quick and easy, and it will get the students thinking and engaged right away, even if we aren't going to be reading the book until later in the day. In fact, they may not even realize that the question has anything to do with a book! This is PART of the "before reading" activity. Show your students your "During Reading" anchor chart that you have prepared, so they know what to be listening for and looking for when you start reading the book. You may decide that you want them to look for other things, but here is what I put on my anchor chart. 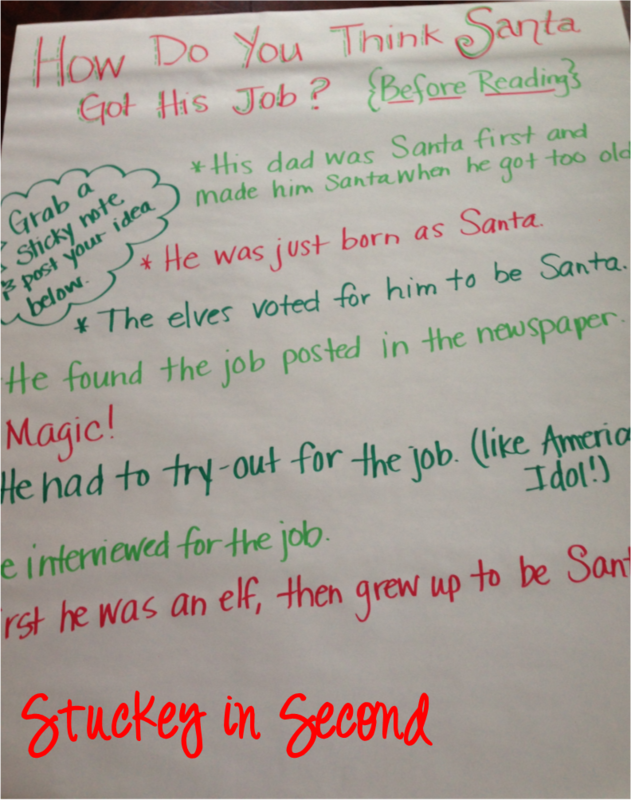 The "ways Santa got his job" could be changed to "Skills Santa has for the job." 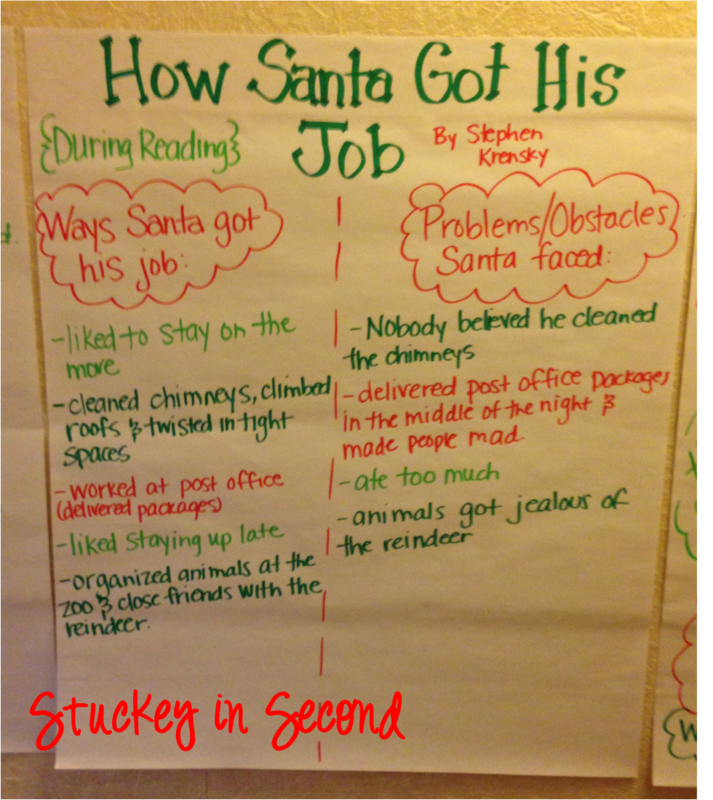 These are basically just a few big things that happen in the story that you want your students to be ACTIVELY listening for! Next, is the easy part...start reading the book! 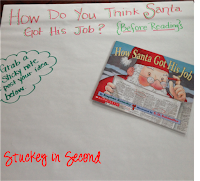 As you read, THINK ALOUD, stop and say things like, "Oh, here is a good skill that would help him be Santa, I'm going to add that to the anchor chart." 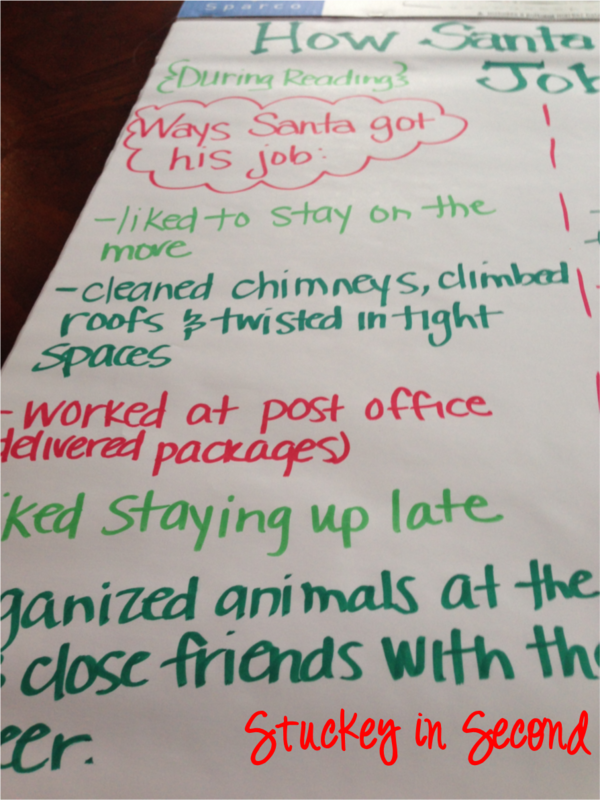 and "Wow, I think that job will help him get the job as Santa, I'm going to add that to the chart." 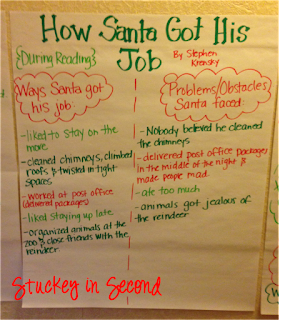 Also, "Oh no, that's a big problem and obstacle that got in Santa's way, let's record that to talk about later." Let the kids raise their hands and "think aloud" too. Sometimes, if you don't normally teach like this, it can be hard to get used to because the story will be interrupted many times! BUT, that's super important if you are really modeling how to "think while reading." The only way to truly model it is to do it OUT LOUD and unfortunately, that may interrupt your perfect story... in a GOOD way! After finishing the story, we go over and discuss some of the things that we came up with DURING READING and decide if we need to add anything that was really important. Then we move onto the AFTER READING portion of the lesson. There are a few ways that you can do this. 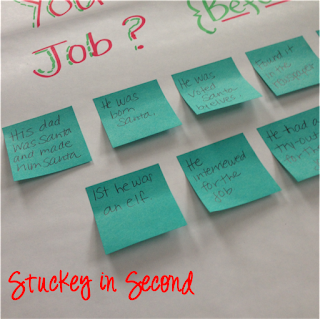 You can simply just have a discussion, you can pose and post the questions, then have the students choose one to answer on a sticky, or you can actually have them pull out a response type notebook to answer the questions. The "after reading" portion should connect the before and during reading portions of your lesson and shouldn't skipped! 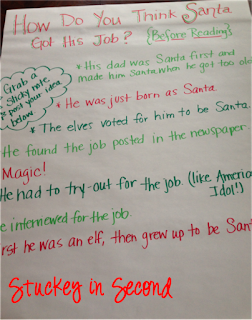 It's important to help with your students' comprehension! 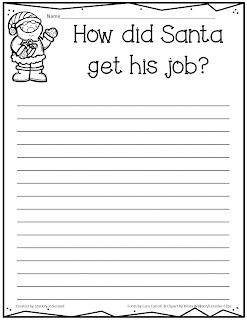 Although I just have my students respond on a sticky note or in a response notebook, I am including a freebie today with some of the response questions and a place to answer the questions. You can choose one of them or all of them, or you could have your students choose which one they'd like to answer! 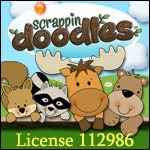 Visit my store for this freebie (click on the picture below!) and please let me know if you do this lesson and how it goes! I can't wait to hear! 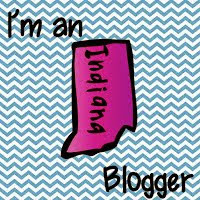 I am going to do this next week, thanks for the great ideas! Thank you for your feedback and also sharing it in Facebook! I really appreciate it!! !